Chloe cuts the ribbon to her new home. 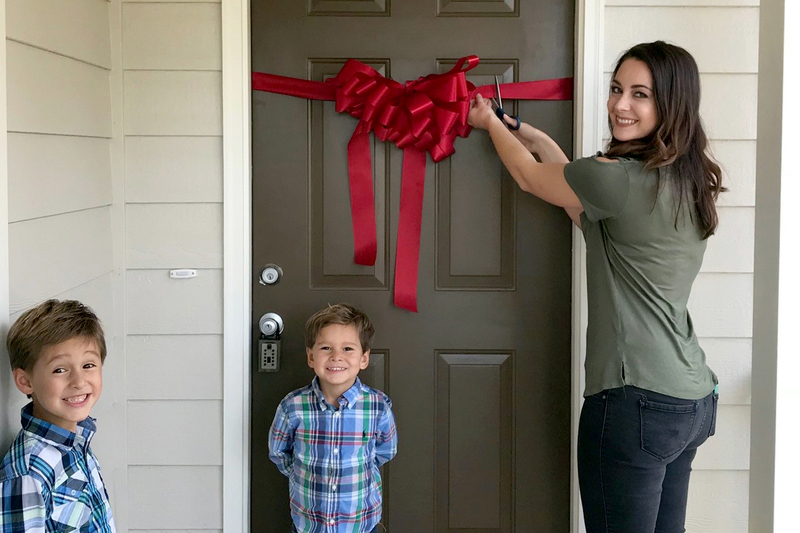 On October 20, 2017, HFHWM dedicated two homes in the Overlook Subdivision behind Spring Hill High School. 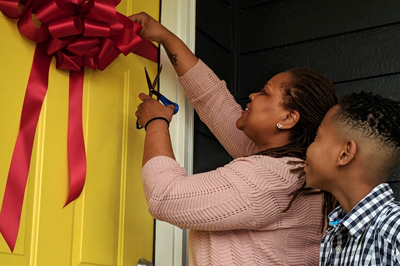 Sponsors, family, friends, and volunteers were on hand to celebrate the hard work of Chloe Jenkins and Angel Turrentine, two single mothers who have worked alongside volunteers to build their homes over the last ten weeks. Angel cuts the ribbon to her new home. Both future homeowners are employed in the healthcare field. Chloe Jenkins works at the Wang Vision Institute in Nashville and has two boys, Jacob (6) and Mason (4). Before qualifying for the Habitat Homeownership program, she kept most of her belongings packed in boxes, just in case her rent went up again and she had to move. Angel Turrentine attended Kaplan Career Center in Nashville to obtain her Medical Assistant Certification and works with patients at Heritage Medical Center in Franklin. After completing the homeownership program and getting settled in her new home, Angel plans to continue her education and become a radiologic technologist. In addition to challenging circumstances in her youth, Angel had to battle cancer as an adult. “It was definitely the most difficult life experience I have ever faced, but the hardship opened my eyes to Christ. Through Him, I believe all things are possible.” As a single parent, the possibility of a better life for her son, Latavieous Lee (10), is her primary focus. The $70,000 needed to fund the “bricks and sticks” of each home was funded by nine community partners: CapWealth Advisors, CMG Financial, Community Health Systems, First Farmers Bank, General Motors – Spring Hill Plant, Harpeth Presbyterian Church, St. Peters’s Episcopal Church, TransCanada, and Wells Fargo. In November 2017, HFHWM will close and sell the homes with affordable, zero-interest mortgages to Turrentine and Jenkins.